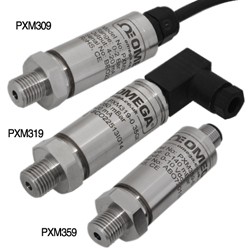 OMEGA's PXM309 series industrial pressure transducers combine two of our precision manufacturing techniques. Low pressure ranges from 0-70 mbar up to 0-3.5 bar, and absolute ranges to 20 bar use a precision micromachined silicon sensor protected by a stainless steel diaphragm. A thin film of oil transfers the pressure and assures the high accuracy and stability of the sensor. Medium and high Gauge pressure ranges, from 0-7 bar up to 0-700 bar, use precision semiconductor strain gauges that are fused directly to the stainless steel diaphragm yielding a rugged, durable bond that assures long life and high stability. The PXM309 series transducers are available in absolute, or gauge (relative) pressure and are sealed to an IP65 or IP67 environmental rating, depending on the model. (See table below). Note 1: Total error band includes all accuracy errors, thermal errors, span and zero tolerances. Bandwidth: DC to 1 kHz typ. The Most Popular Models are featured in the "To Order" table below. If the delivery time shows 1 week, please call our Sales team, as most times we can ship SAME DAY or NEXT DAY. See the "Part Number Builder" under the "To Order" table to select all other available models and options. The PXM309 is also available in imperial configurations, with ranges from 0-1 psi to 0-10,000 psi and 1/4"-18 NPT) imperial fitting. Please see the PX309-5V for complete details, or contact our Sales department for more information. 0-70 millibarG (0-1 psig) range. 0-140 millibarG (0-2 psig) range. 0-350 millibarG (0-5 psig) range. 0-1 BarG (0-14.5 psig) range. 0-2 BarG (0-29 psig) range. 0-3.5 BarG (0-51 psig) range. 0-7 BarG (0-101 psig) range. 0-10 BarG (0-145 psig) range. 0-15 BarG (0-218 psig) range. 0-20 BarG (0-290 psig) range. 0-35 BarG (0-508 psig) range. 0-70 BarG (0-1015 psig) range. 0-140 BarG (0-2031 psig) range. 0-200 BarG (0-2900 psig) range. 0-350 BarG (0-5076 psig) range. 0-500 BarG (0-7252 psig) range. 0-700 BarG (0-10,153 psig) range. 0-1 Bar Absolute (0-14.5 psia) range. 0-2 Bar Absolute (0-29 psia) range. 0-3.5 Bar Absolute (0-51 psia) range. 0-7 Bar Absolute (0-101 psia) range. 0-15 Bar Absolute (0-218 psia) range. 0-20 Bar Absolute (0-290 psia) range. 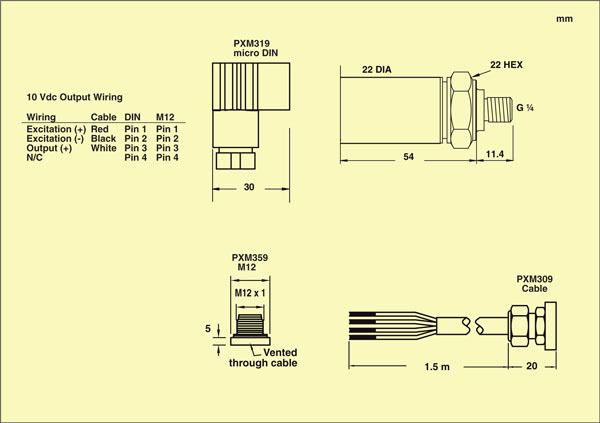 M12 models require vented cable on gauge pressure units below 70 bar.